World map exhibiting a common interpretation of Oceania. Oceania (sometimes Oceanica) is a geographical, often geopolitical, region consisting of numerous lands—mostly islands and usually including Australia—in the Pacific Ocean and vicinity. 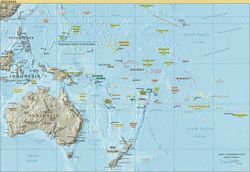 The exact scope of Oceania is defined variously, with interpretations normally including Australia, New Zealand, New Guinea, and various islands of the Malay Archipelago. The term is also used by many authors and in many languages to define one of the continents. , , . The primary use of the term Oceania is to describe a macrogeographical region that lies between Asia and the Americas, with the Australian continent as the major landmass and consisting of some 25,000 islands in the Pacific. The name Oceania is used because, unlike the other regional groupings, it is the ocean and adjacent seas rather than a continent that link the lands together. Originally coined by the French explorer Dumont d'Urville in 1831, Oceania has been traditionally divided into Micronesia, Melanesia, Polynesia, and Australasia. As with any region, however, interpretations vary; increasingly, geographers and scientists divide Oceania into Near Oceania and Remote Oceania. Most of Oceania consists of small island nations. Australia is the only continental country; by some definitions, Indonesia has land borders with Papua New Guinea, East Timor, and Malaysia. ^ Excludes Timor-Leste and parts of Indonesia, island territories in Southeastern Asia (UN region) frequently reckoned in this region. ^ Indonesia is generally considered a territory of Southeastern Asia (UN region); wholly or partially, it is also frequently included in Australasia or Melanesia. Figures include Indonesian portion of New Guinea ( Irian Jaya) and Maluku Islands. ^ Excludes the US state of Hawaii, which is distant from the North American landmass in the Pacific Ocean and frequently reckoned in this region. ^ Fagatogo is the legislative and judicial seat of American Samoa; Utulei is the executive seat. Australia is sometimes not included in Oceania, although a term like Pacific islands would normally be used to describe Oceania without Australia. The term "Australasia" invariably includes Australia, and usually includes New Zealand, Papua New Guinea, and parts of Oceania, but this term is sometimes controversial outside of Australia, as it may be seen as indicating a link with Asia - a completely separate continent, or too greatly emphasising Australia. "Austral" means "of, relating to, or coming from the south", and is the common root of both Australia and Australasia. Hawaii is generally included in Oceania, even though it is a part of the United States. Although the Hawaiian Islands are some distance from most of the islands of Oceania, they are still physically as well as culturally much closer to the rest of Oceania than to North America (for example the Hawaiian language is a member of the Oceanic language family) - and they are no further from the rest of Oceania than from United States territories in the North Pacific. The few U.S. territories in the North Pacific are uninhabited except by itinerant service personnel, and are normally grouped with the mainland United States in North America. They are generally not considered part of Oceania and, unlike Hawaii, they are closer to North America - most of them closer to North America than they are to Hawaii. Easter Island is a Polynesian island in the eastern Pacific Ocean, part of the territory of Chile, and is generally included in Oceania. New Zealand is within the Polynesian triangle and in this sense is part of Polynesia - the Māori of New Zealand constitute one of the major cultures of Polynesia. On very rare occasions the term may be stretched even further to include other Pacific island groups such as the Aleutian Islands. Oceania is one of eight terrestrial ecozones, which constitute the major ecological regions of the planet. The Oceania ecozone includes all of Micronesia, Fiji, and all of Polynesia except New Zealand. New Zealand, along with New Guinea and nearby islands, Australia, the Solomon Islands, Vanuatu, and New Caledonia, constitute the separate Australasia ecozone. The Oceania Football Confederation (OFC) is one of six football confederations under the auspices of FIFA, the international governing body of football (soccer). The OFC is the only confederation without an automatic qualification to the World Cup Finals. Currently the winner of the OFC must play-off against a South American confederation side. Oceania has only been represented at three World Cup Finals - Australia in 1974, New Zealand in 1982 and Australia in 2006. However, Australia is now no longer a member of the Oceania Football Confederation, having joined the Asian Football Confederation in 2006.